What Health Risks Do Boxers Face? While boxing accounts for fewer deaths than many other sports, the BMA says this is insignificant compared to the effects of brain haemorrhage and / or brain tissue damage that may go unrecorded in many boxers. Cuts and bruises are the most common boxing injuries, and many boxers leave the ring needing stitches to the face and dental work. Body blows can lead to broken ribs and internal bleeding. Potentially blinding eye injuries can be difficult to detect except by specialist examination. But, as boxing involves powerful people hitting each other repeatedly, often around the head, there are other risks - most serious of all being permanent severe brain damage. While other injuries repair relatively easily, brain tissue, once damaged, remains damaged. The symptoms of such brain damage - commonly known as being "punch drunk" - include slurred speech, slow reactions and even occasional blackouts (‘chronic traumatic encephalopathy’). Over 80% of professional boxers have serious brain scarring on MRI scans. Many people assume that the predicament of the world's most famous fighter, Muhammad Ali, was brought about by his numerous "wars" in the ring. But he is suffering from Parkinson's Disease and there is only circumstantial evidence to suggest it was brought on by his boxing career, although the condition is more common in ex-fighters than the general public. Catastrophically, meaning it follows an injury sustained in a single bout. This was the case in the Watson bout, when a blood vessel in the skull burst and a clot put pressure on the brain tissue Gradually, meaning the brain damage builds up as a result of repeated blows to the head. The BMA, which represents 84% of the UK's doctors, opposes boxing primarily because of the threat to the brain and eyes. Doctors who support boxing say there are no serious risks if proper medical care is available at the ring. Michael Watson's High Court claim centred on whether better treatment early on would have prevented the serious damage he sustained. Certainly ringside medical care has improved since then. However, Paul Ingles, seriously injured after a fight in 2000, sustained serious brain injuries despite immediate ring side treatment, and is permanently disabled as a result. In 1995 the British Board of Boxing Control introduced a raft of measures to improve safety. 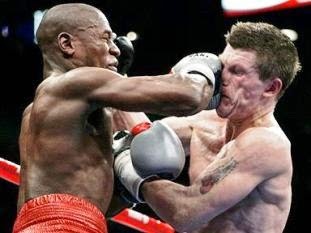 One was the introduction of annual MRI brain scans for boxers, and the minimum length of time between fights for boxers who suffered a knockout was extended from 28 to 45 days. However, the BMA's concern remains with head injuries. For the moment it continues to lobby for a total ban on boxing for men or women. Why are boxing injuries different to those in other sports? Professor Hugh Bayne, from Sunderland University, has examined the case law surrounding boxing and suggested a way to get the sport as good as banned. He wrote in the British Medical Journal that doctors could make boxing illegal in the UK simply by withdrawing their support and refusing to attend bouts. He pointed out medical cover is a legal requirement at all boxing promotions and, given the dangers associated with the sport, asked if the profession should withdraw its co-operation.